Android app support arrived on Chromebooks well over a year ago although the rollout wasn’t exactly universal. You see, support trickled out initially to a limited selection of devices meaning the experience from one Chromebook to the next isn’t necessarily the same. Microsoft is doing its part to unify the Chromebook experience by bringing its entire Office suite to the affordable Windows alternative. As Chrome Unboxed correctly highlights, this won’t mean new functionality for all. 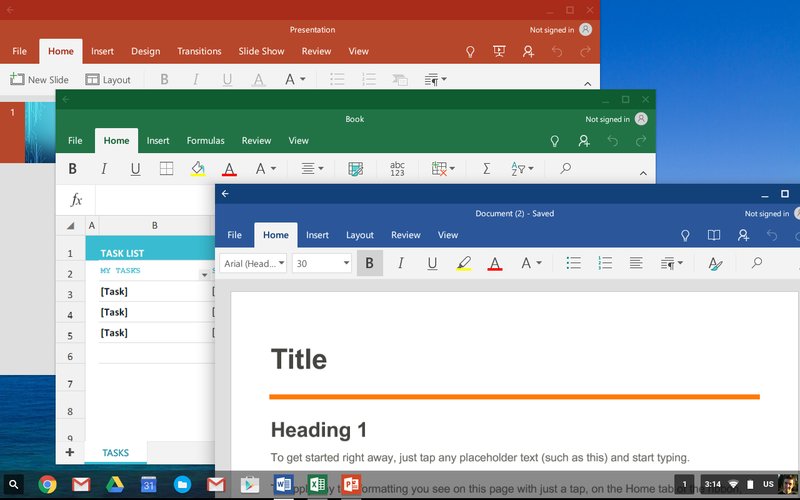 Some Chromebooks have worked flawlessly with Office apps for over a year. Most others, however, have either never seen the apps on offer or have had a sporadic, inconsistent experience. Of course, why it took so long for Microsoft to iron out the kinks remains a mystery. Microsoft provided no formal announcement on the matter but support does seem universal (or at the very least, much more universal) than it did before. Chrome Unboxed checked the Samsung Chromebook Pro, the Acer Chromebook 15 (two different models), the Acer C771 and the Pixelbook – all of them now show Microsoft’s Office suite in the Play Store. Office is far from the only game in town as there are multiple productivity-minded alternatives to choose from. That said, Microsoft has a dedicated Office fan base, many of which aren’t exactly hip to the idea of change and trying something new. With Office now widely available, it’s plausible that some holdouts may finally take the plunge and give a Chromebook a shot as a productivity machine.